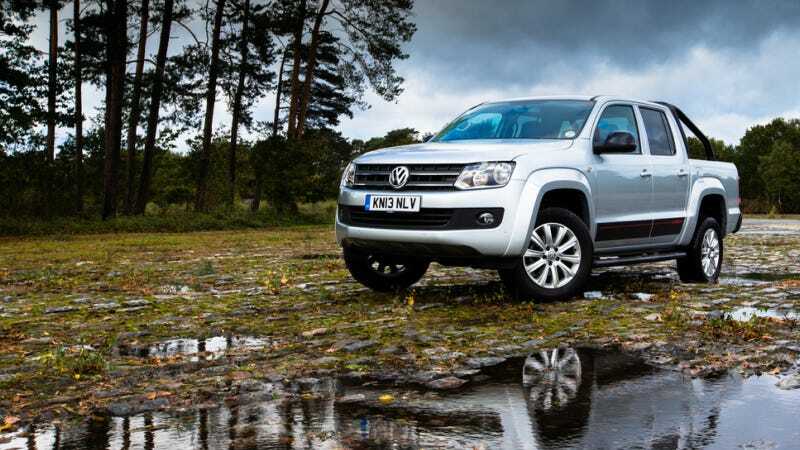 England's 4x4 Magazine has named the 2014 Volkswagen Amarok their "Pickup of the Year," just throwing sand in the face of us Americans who will continue to be denied access to the vehicle. Apparently the VW trumped other diesel four-door pickup competitors from Great Wall, Nissan, Mitsubishi, Ssangyong, Toyota, and Isuzu in an all-around value and viability-for-purpose test. 4x4's editor Nigel Fryatt described the Amarok's 2.0 liter BiTDI turbo diesel as "the best engine of the group, both in terms of on-road response, and off-road ability" and went on to praise the eight-speed automatic, citing the truck as the "clear winner" despite costing twice as much as the cheapest in the lineup— the Great Wall Steed. Volkswagen maintains that there are no plans to bring the truck stateside, despite vague quotes from departing CEO Jonathan Browning calling pickups and commercial vans "an opportunity" in the US. Interestingly the Ford Ranger, which won their test last year, was excluded because in their reckoning: "If you place an order for a new Ford Ranger today, evidence is that it could take over a year for that order to be fulfilled." I know many of you miss the Ranger dearly, and the fact that it's so popular abroad feels like a little more salt in the wound of us small truck fans in here America. If that's not enough to make you want to throw some English crates in the ocean like it's 1773, don't forget the Brits also have access to the diesel Wrangler. If only the founding fathers could have known the redcoats go on to hoard the best little oil burners, they might have added a few extra stipulations in the Declaration of Independence.